this is (part of) the christmas section at the shop around the corner from our flat. things i don't understand on this shelf include: all of the things. Today's Almanac has me going to the shops 'early in the afternoon to avoid crowds' and stocking up on all the necessary groceries I'll need for the rest of the baking that this month still has in store (someone help me). It's a work day, so I made a quick pit stop at the supermarket on my lunch break to pick up a few needed things, but if I'm being honest, it was more because the Almanac told me I had to than because I actually needed any of the groceries. Shopping in a city where you don't own a car is always a bit different than shopping with a car, because you can't buy as many things and you have to go to the grocery a lot more often, but I make it work... and when we need a big batch of heavy staples like flour, sugar, olive oil and wine, Judson just goes instead. And although I hate going to the grocery store when it's crowded, there's something exciting about going to a British supermarket this time of year. I've lived in Scotland long enough to know all the 'new-to-me' things that the shop has to offer year-round, but this is only my third Christmas here, and every year I find another strange new Christmas food I'm dying to try (this year's is brandy butter and pourable custard. WHAT DO YOU DO WITH THEM??). Our first Christmas here I discovered how Scots associate Stilton with Christmas and it is still odd to me. Like, this time of year in the average supermarket, you can buy a dinner-plate-sized wheel of Stilton for £3, which, although I love cheese, still seems a bit excessive. When I asked a friend about this recently, her response was 'I don't know why it's so much more popular now. I mean, I personally don't feel the need to swap out my cheeses based on the season, as I love all cheeses no matter the season, but maybe for some people it's important?' So there you go. If I can find a use for brandy butter, I'll let you know! The other instructions for the day were to make an 'Answer Cake,' some kind of cake that involved a cake mix, frosting, and the pan all in one box. 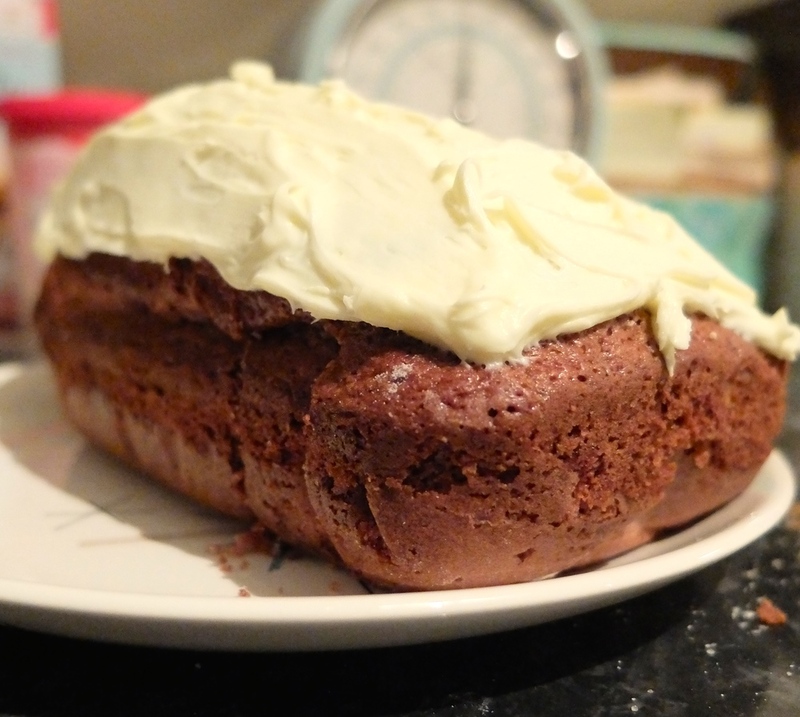 Obviously I couldn't find one of those, so I whipped up a quick half-recipe of this cake and it wasn't half-bad. File christmas puds under the list of british Christmas foods i don't understand, they look like this, but this is not a real christmas pud, just an ornament made to look like one hanging on our tree. So consider this one done. I got the things I needed for tomorrow's treat (one I'm pretty excited about, if I do say so! ), and even if I still have to hit the grocery store twice more before the end of the weekend, it still helped get things a little bit more done today. 4 spoons out of five. I hate going to the grocery at Christmas time because it's always so crowded and busy, but doing it early in the day really does help... if only my work schedule allowed that more often! And as for the 'Answer Cake,' it really wasn't too shabby, either.